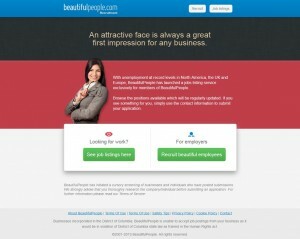 BeautifulPeople.com has caused yet another global storm with its latest service for members: a recruitment agency, based on their belief that employers wish to hire good looking staff. Please don’t think we agree with the site’s principles: we do however handle all press, crisis matters and media relations globally for the site and we’ve had a great deal of interest – as always – from tv and newspapers the world over. We’re currently preparing for a morning TV show appearance…(not us, we’ve not got enough time to spend as long as we’d need to in hair and make-up…). But watch this space!